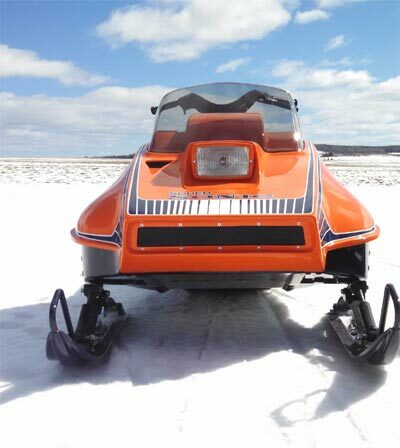 Tim recently (2/10) sent some updated pictures including his very nice '70 Capri that has a 399 JLO on it to mimic a sled he had years ago. 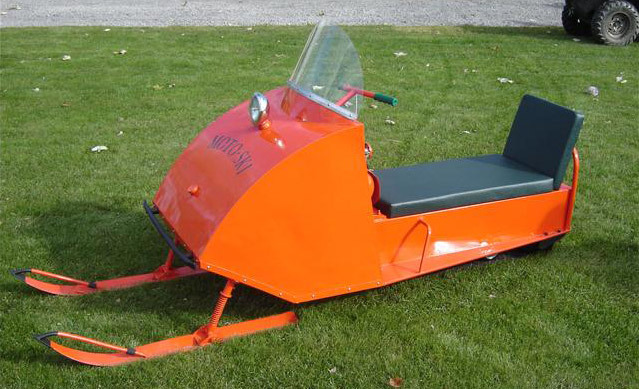 Have a look at the new lineup which also includes nice machines of other brands. 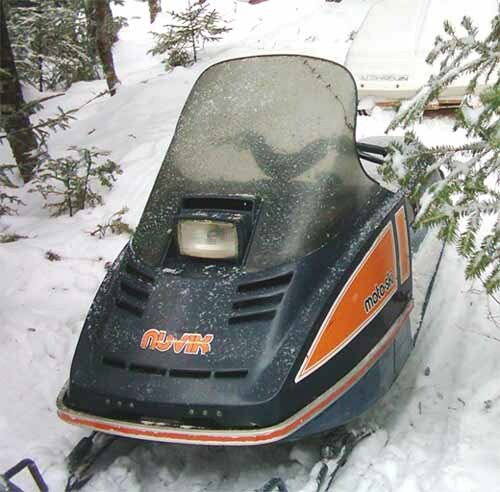 other nice machines, a nice '77 Everest 340 and a '74 T'NT 400 F/A. 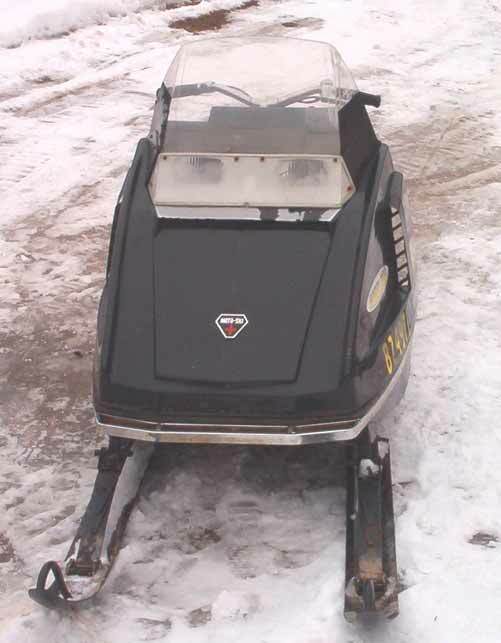 engine (BSE 440T) but sports a serial number that bombardier verifies to be a '75 440 Olympic. were stored inside with covers their entire lives. You don't see too many of these around. Having just said that you don't see many of these, here is another. 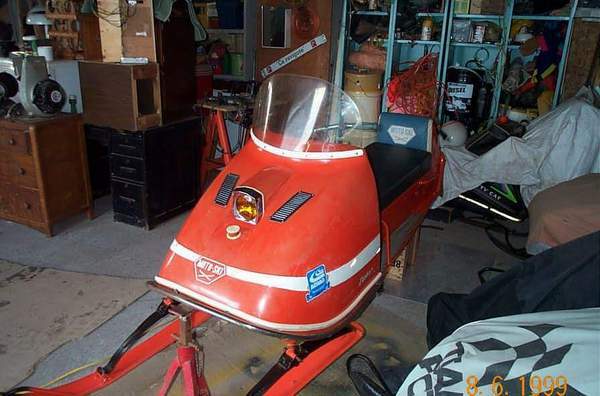 This one is in as good original condition as you will ever find. 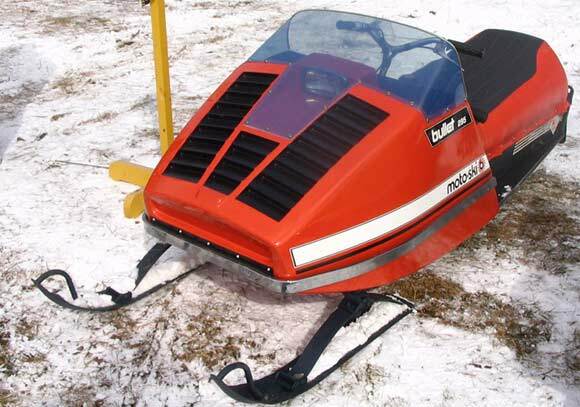 Although a ski-doo in disguise, these sleds were tough and reliable. 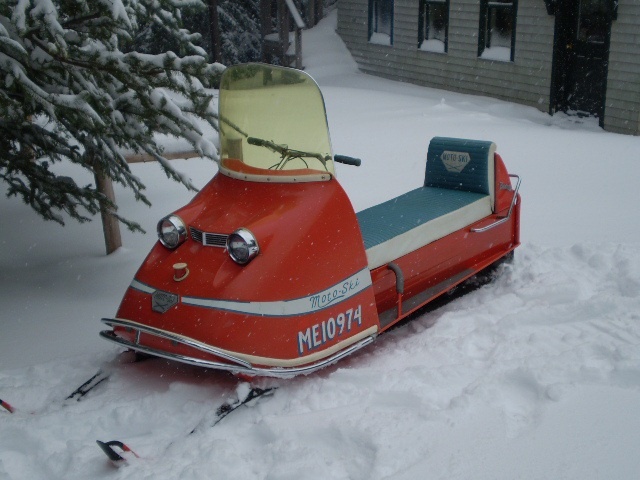 A little work and any visitors will think they were shopping in an early Moto-Ski dealership! 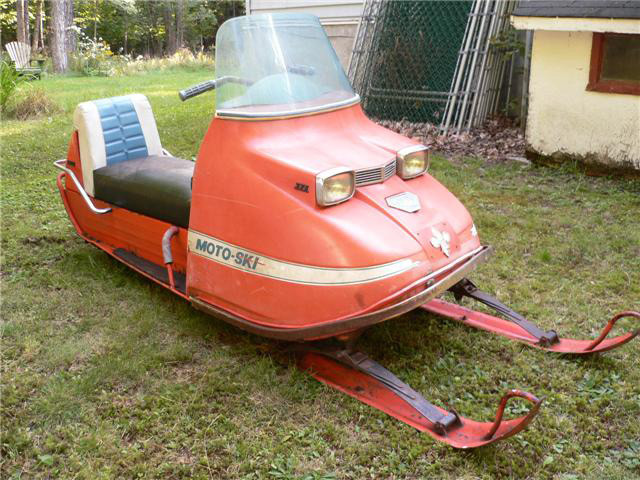 A fine original example of a much forgotten time in Moto-Ski history. mechanically similar to its predecessors. 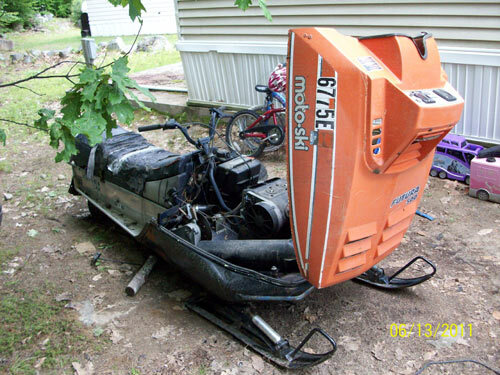 A well preserved and rare piece of Moto-Ski's early days. 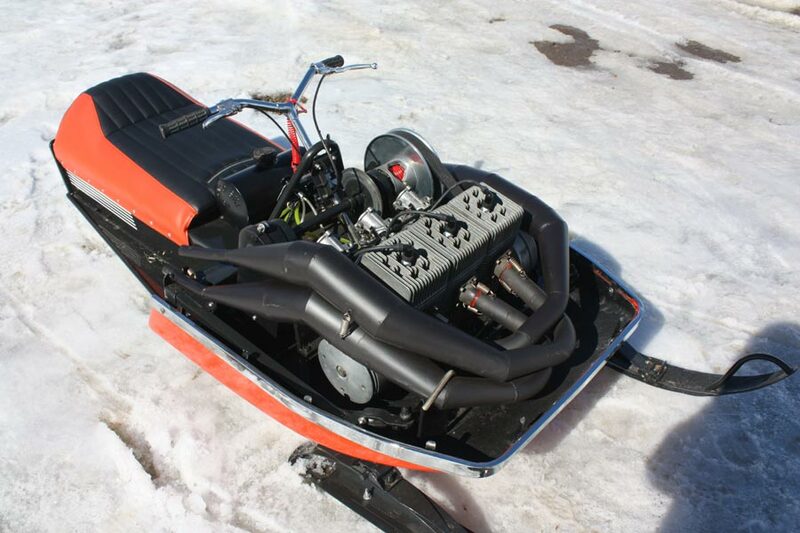 version of the Ski-Doo Everest 444 LC. it is one of the nicest originals you will find. be returned to its original gold metal flake. that have many other stable mates equally as nice. they do them more justice than what I can write. over the years. 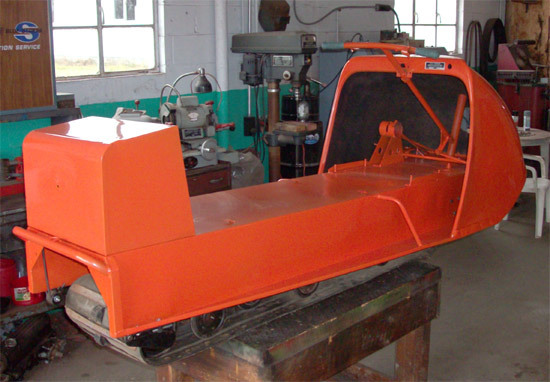 The 340 Zephyr still sports its factory look and appears to be a good solid start to a restoration. The 440 Zephyr on the other hand refuses to admit its age and so wears a sportier ’72 Grand Prix hood. 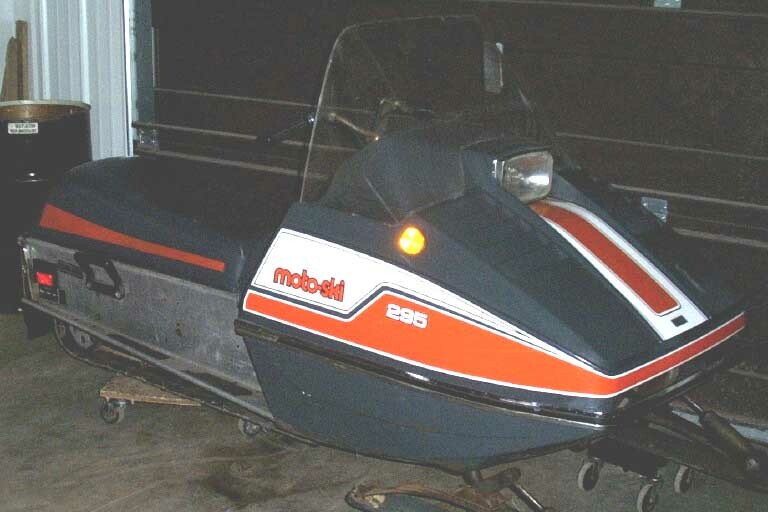 The grand prix is a very nice low mile original with the often forgotten Sachs engine option. 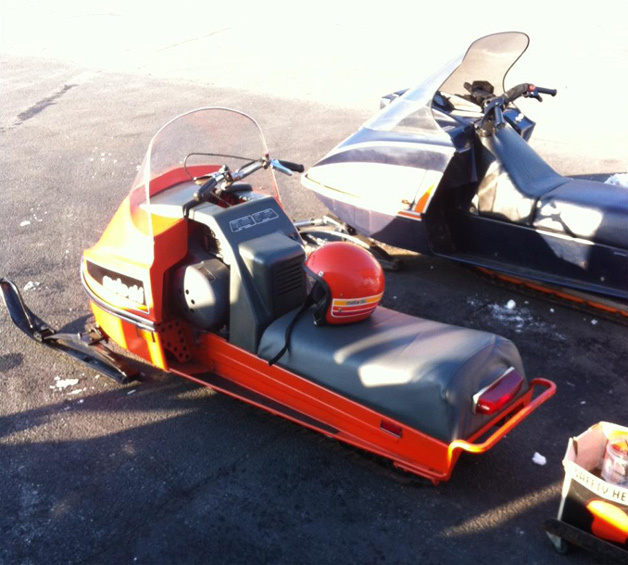 Both the 1975 and 1978 moto-skis are beautiful restorations of rare sleds. Are these enough to make you drool? 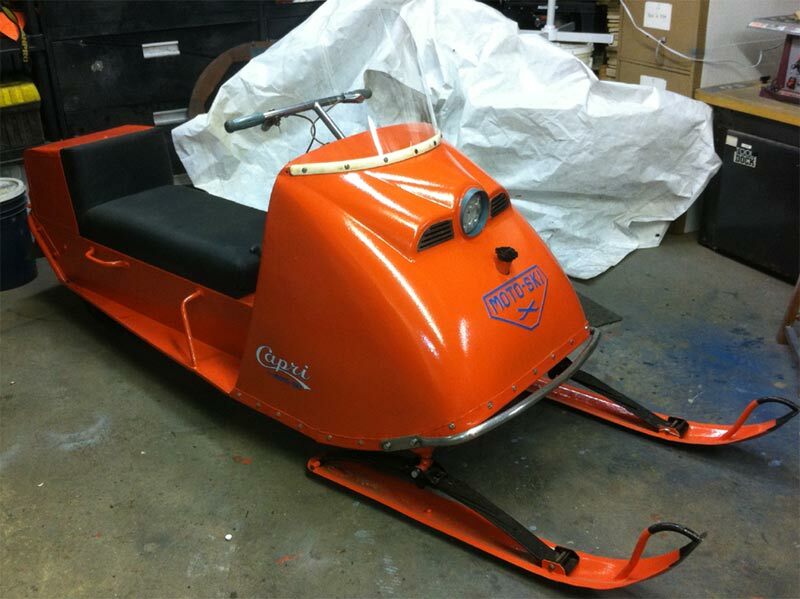 If not Charlie also has another 340 Sachs Grand Prix and a 634 Hirth Grand Prix to name a few. 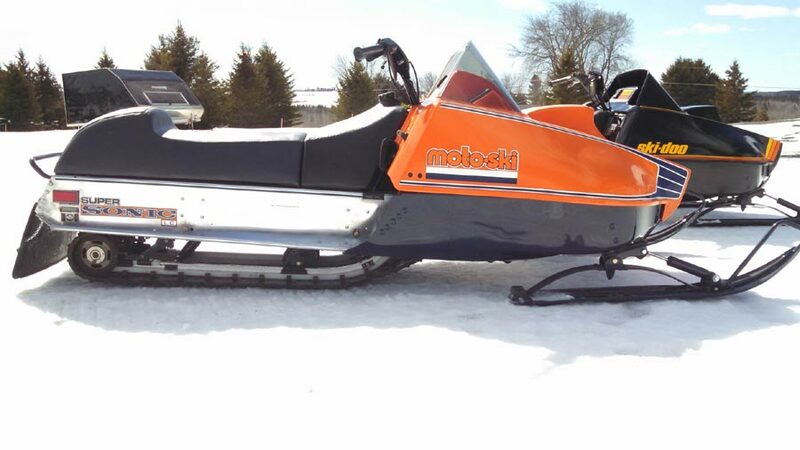 moto-skis can have a sporty side to them. 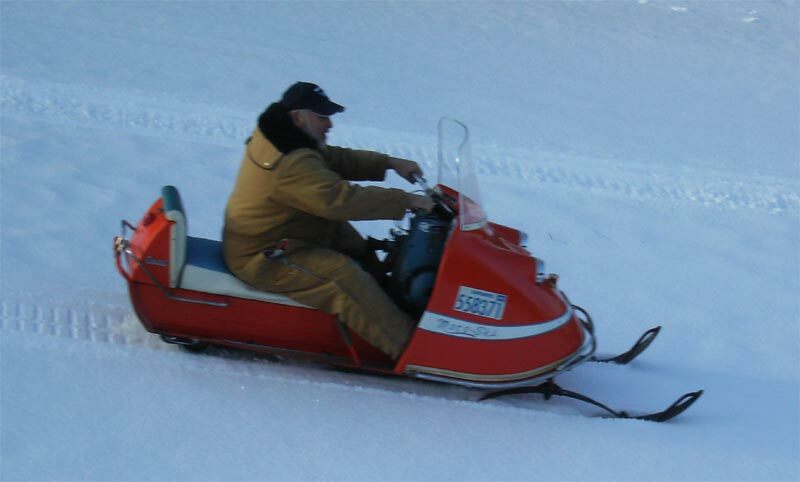 had the sled given to him 5 years ago and has since refreshed the paint so that it looks its best on ice fishing trips. 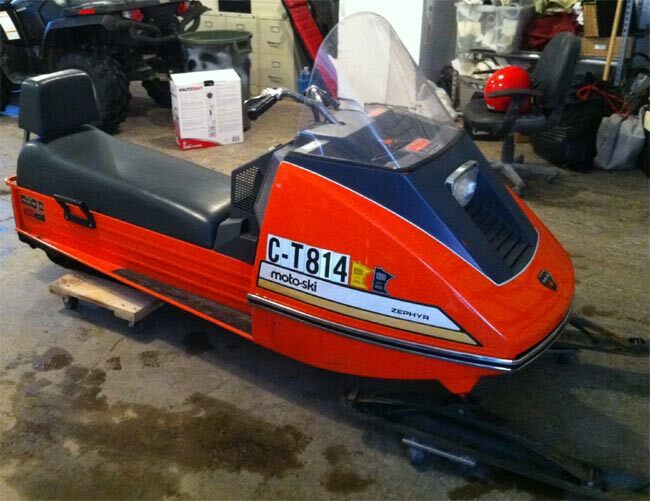 No its not a Moto-Ski, its not even orange but it is a beautiful machine that deserves its fair share of the lime-light. 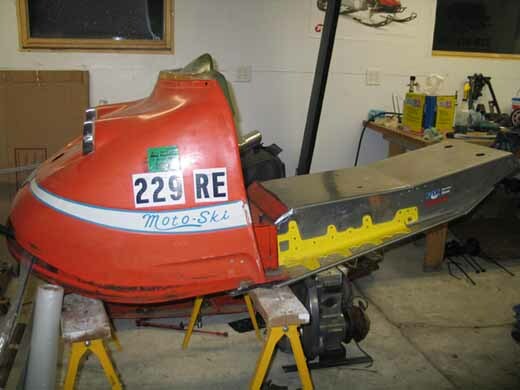 fear not because Andrew is currently restoring a 1971 Moto-Ski Mini-Sno. 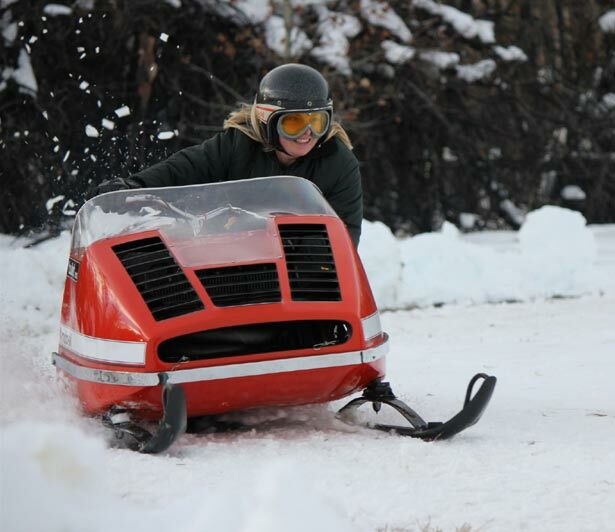 pictures all three are very solid and deserve the time and effort to get them back on the snow. the '68 and some comical roadrunner + coyote stickers saying "Beep Beep Your A**" on the '69. 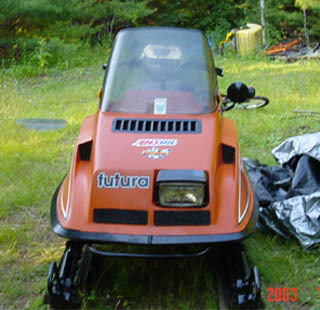 plastic hood, bumpers with good chrome, and a nice original seat were all there to start with. Have a look at the picture, it speaks for itself. one you do not see too often. see, the machine has survived quite well over the years. 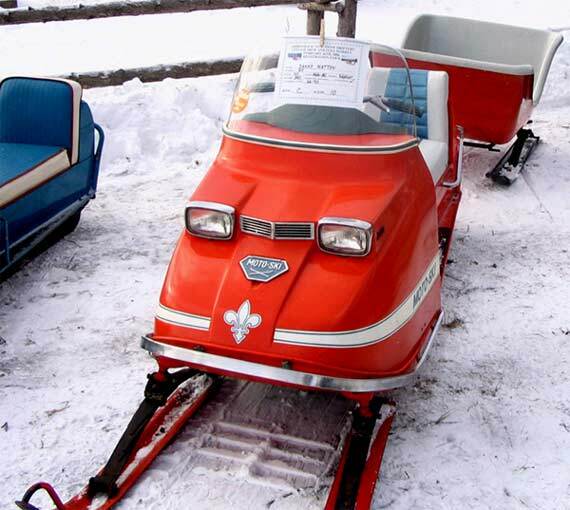 of a very rare machine. 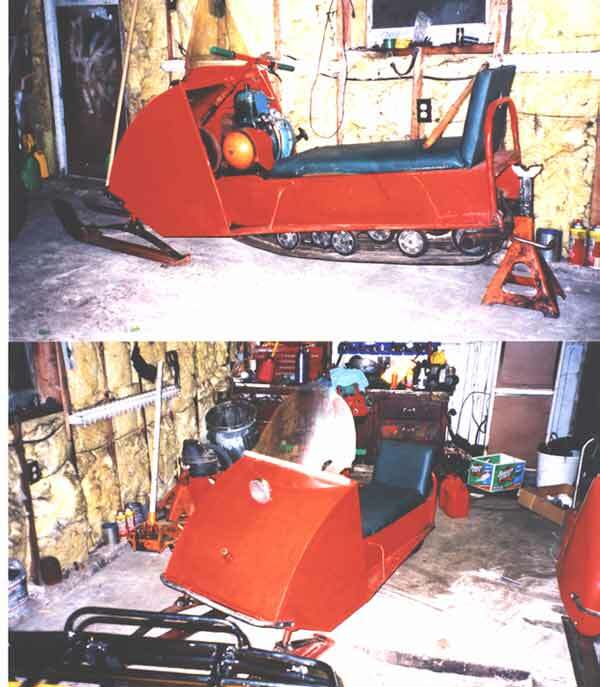 Be sure and check out the other neat machines featured on his website too. 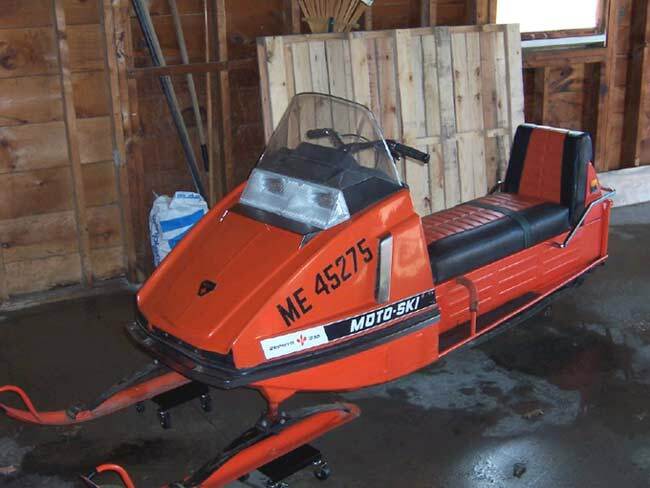 No it is not a Moto-Ski but I did once own it so I guess that qualifies it for a Moto-Ski website. found a new tach, speedometer, and rubber passenger grab handles to replace the old broken ones. All in all it is a great looking machine that should be fun to ride alongside his '68 Panther. 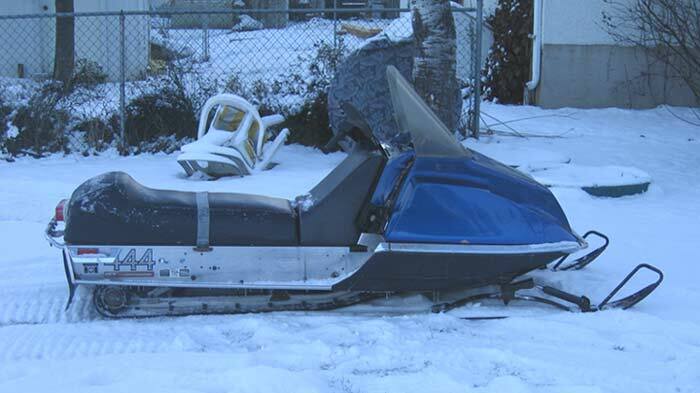 the sled in a well used condition from an old man in Moto-Skis home town of La Pocatiere. 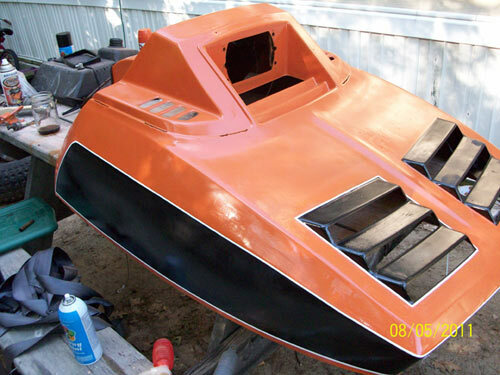 and a restored Evinrude Cutter to go along with the '71. 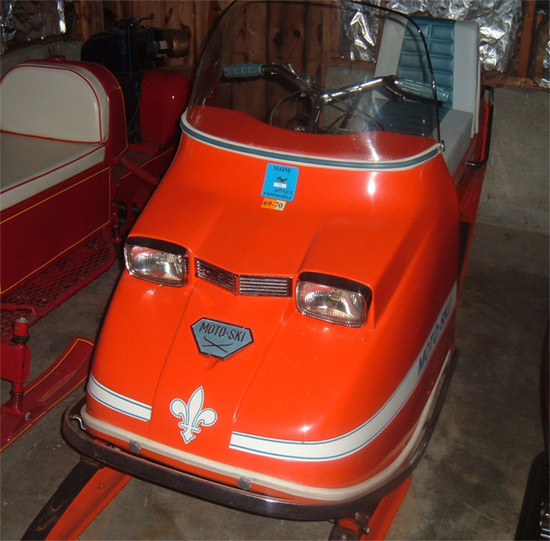 With the exception of absent hood decals, it would be hard to find a nicer and more original "F" series Moto-Ski. blue since the photo was taken. due to the deluxe dash (300's usually didnt have it) but cant be sure just yet. 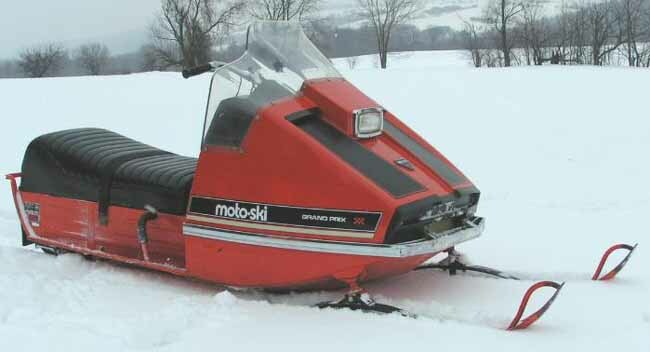 is a nice example of what I consider to be one of the best looking years for Moto-Ski. 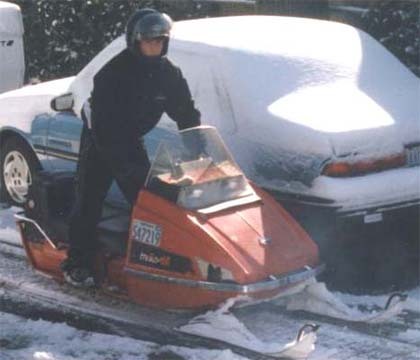 around 700 miles on it since '99 so not only is it in amazing condition but its still enjoyed as it was intended. back on it. 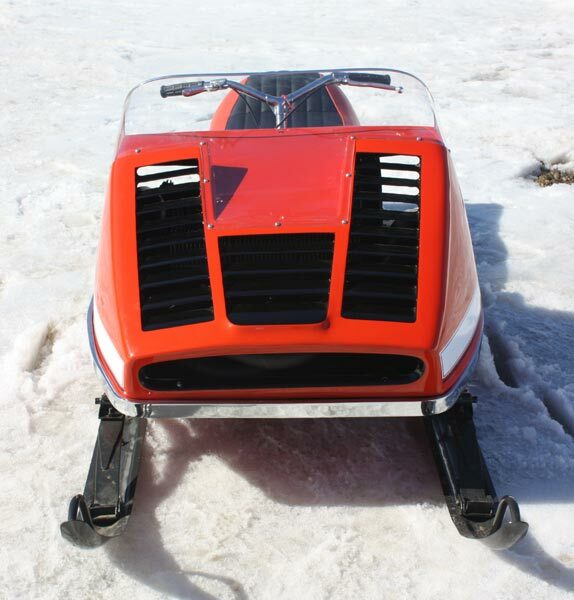 Yan also has a 440 Nuvik project waiting in the wings which, if the '69 is any indication, will look great when finished. 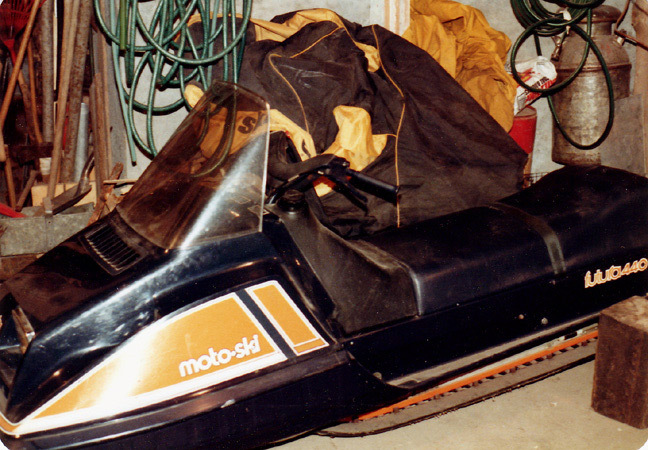 Stuart recently found this spectacular original Moto-Ski which has been sitting idle since 1980 with only 406 miles on the odometer. photo be sure and take note of the Moto-Ski dealer sign in the background. 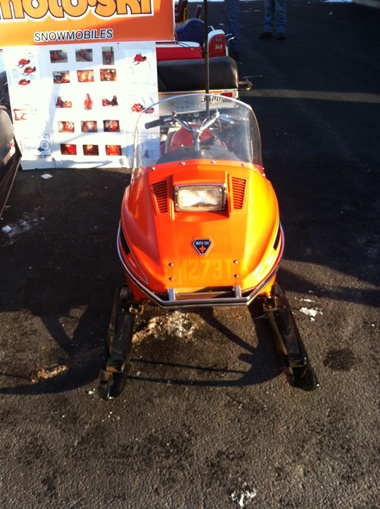 this one looks to be a fine unrestored example of a fun snowmobile. time but as you can see they survived the years very well and are nice original examples of two great models. it involved lots of dragging, a harrowing barge ride to get it off an island, and $25 for the troubles. and it even has the original cover. 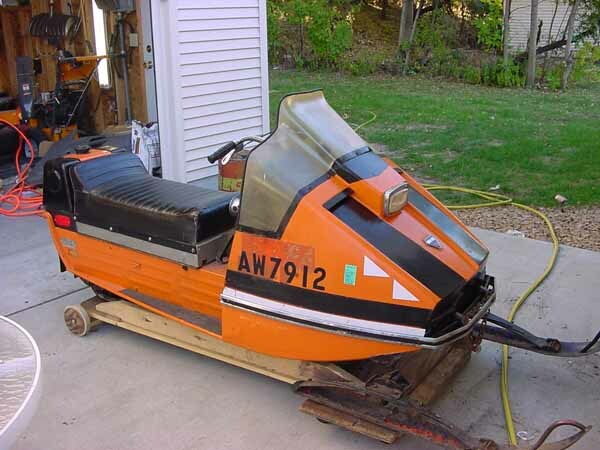 Pat also has a bunch of other equally nice old machines. 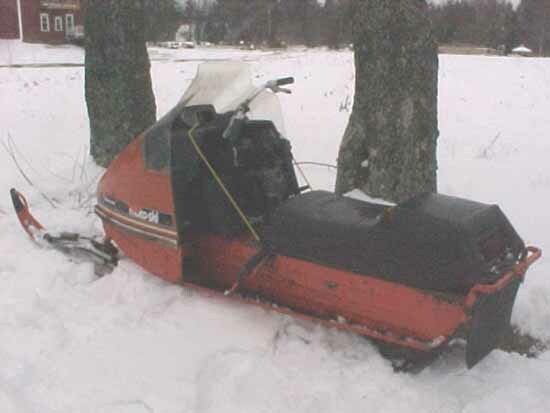 coworker whose uncle had an "old snowmobile". 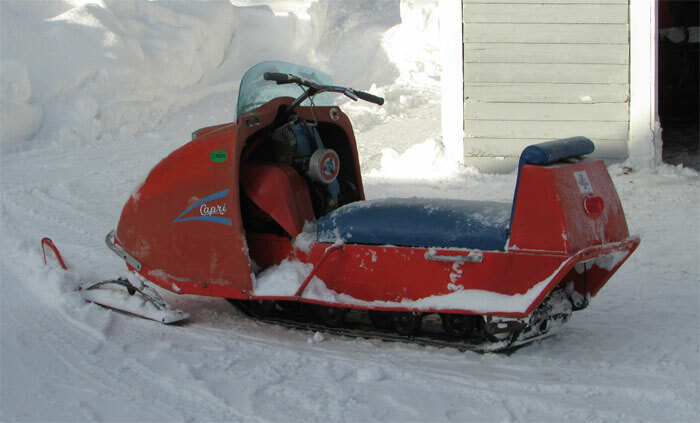 Don't we all wish each old sled we heard of was a '63 tin cab. machine. 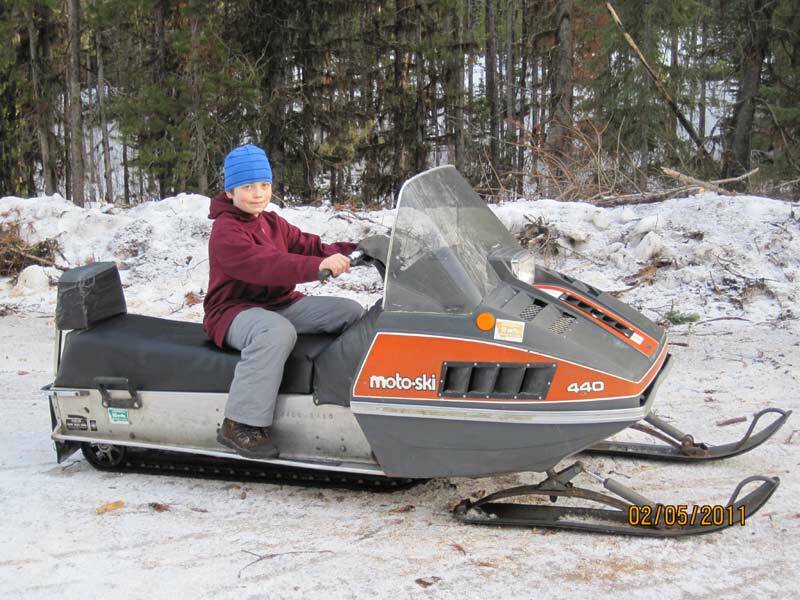 Seen here is Steve's son, Keegan, ready to make some tracks. 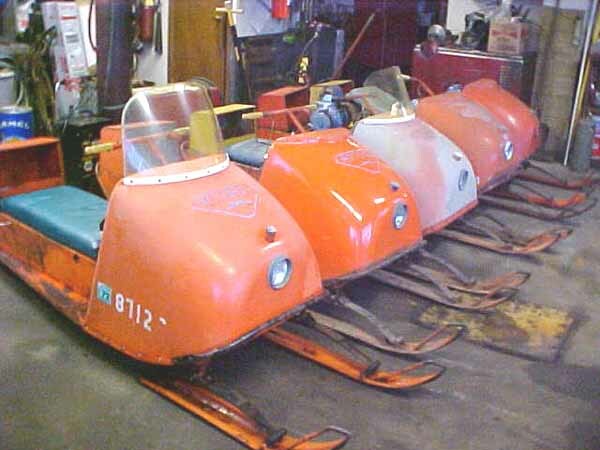 get exercised on vintage rides we hope to see the Zephyr at the next one. under the hood. 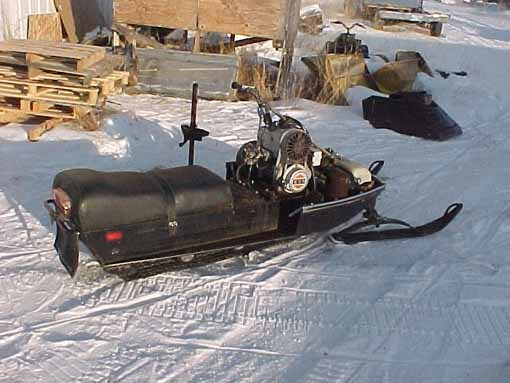 Wouldn't you like to rope start that beast around the pipes after its been running for 10 laps? 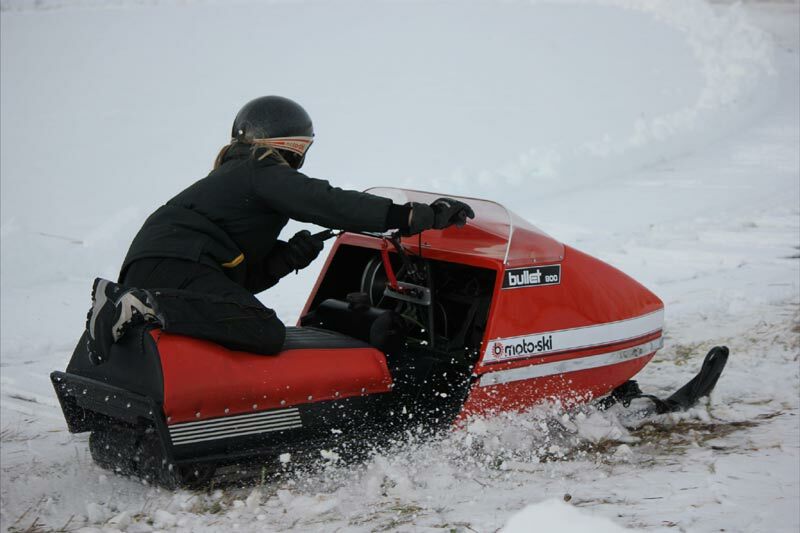 UPDATE- check out these action shots ( 1 , 2 ) with Michelle Derfler putting the Bullet through its paces. back to see updated photos as progress is made. but a good model nonetheless. 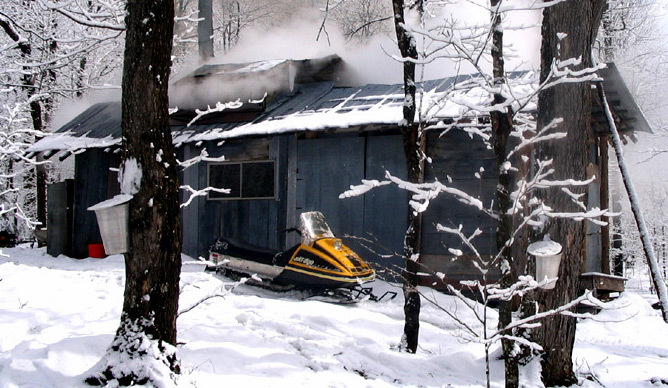 It is definatly worthy of being a museum piece but snowmobiles were built to be ridden so I am glad it still is. '69 Capris. 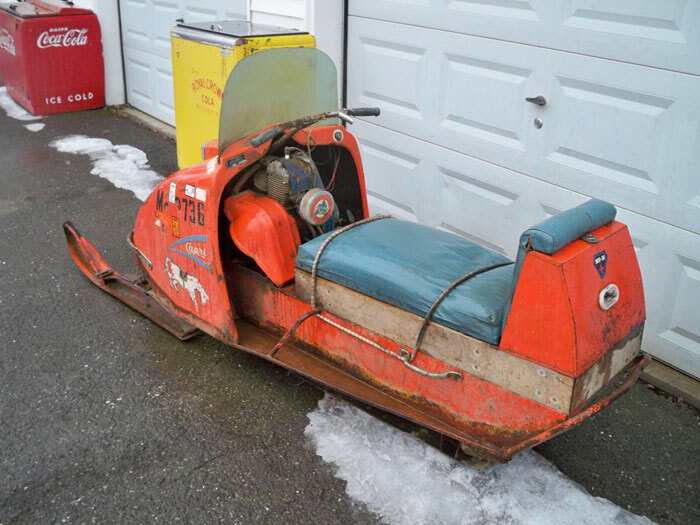 The featured machine here is a very nice original example of a great combination. blue as it would have been from new. Marco even sent along a video of it in action and in case you are wondering it runs as good as it looks. Kelley has refurbished and cleaned just about every part under the hood and as you can see has brought the machine back to a very nice original state The twin carb 503 was a fast trail machine for its time and is no slouch today in vintage racing where Kelley placed fourth in a local event in March 2013.
to find pieces like the engine cover are all still there. The first series '72 292 was just a freshened up '71 292 so are often mistaken for a '71. 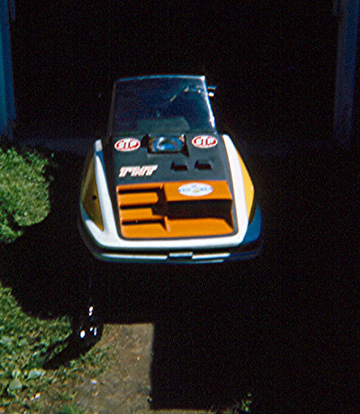 Dan submitted the above photo of the Cadet that his son restored. It looks like he did a wonderful job and proudly displays it at local shows. 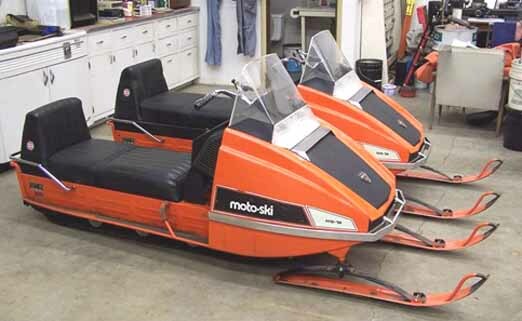 several '73 Capris as well as a '73 "F" to round out the Moto-Ski collection.